The names of the Woudsend alleyways can, for the greater part, be traced back to the 18th and 19th centuries, the era of shipbuilding and shipping. 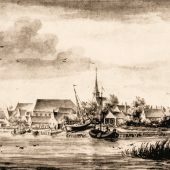 An explanation of the name Woudsend itself is a more intricate exercise and there are many ongoing theories. Most popularly, Woudsend is believed to once have marked the end of a ‘woud’ (wood) or ‘groengebied’ (green area). However, there may be more truth in the theory that the word ‘woud’ refers to the low vegetation on the reclaimed peatlands. The village was mentioned as Woldesende for the first time in 1337. The Frisian version of this name is Waldeseende (1447). The spelling Waldiseind was used in 1477; in 1492, however, we find Wolsende as well as Walseynd in 1509. Nevertheless, the varieties with a ‘d’ are predominant. The varieties Waudseyn (1479) and Waldzein (1522) closely resemble today’s spelling. The chart dating from 1595 with Frisian names states the literal pronunciation Waadseyn. The chart dating from 1579 also states a Frisian name: Waldsein. Woldseijnd is mostly used in 16th century Dutch texts. The chronicler Worp van Thabor used the spelling Woldtsendt (1517), whereas the chart dating from 1664 says Woldsend. The variety Woudsend has been the most frequently used since the 18th century. It is generally assumed that the name literally means ‘end of the wood’. But which wood? It is more likely that the notion of ‘wood’ should be interpreted in its old sense of ‘overgrowth’. The peatlands were once overgrown with shrubs and smaller trees. The peatland reclamation from Oosthem (near IJlst) ended at the northern bank of the Slotermeer. So, technically speaking, Woudsend was indeed situated at the end of the ‘wood’.